Attic insulation promotes, not only energy efficiency, but comfortable indoor temperatures—year round. For best results, however, be sure to supplement attic insulation with air-channeling rafter vents. Here's why. Seasonal extremes in temperature put your attic insulation to the test. To get the best performance out of your insulation year in, year out, you would do well to install rafter vents in your attic. Rafter vents channel air from the vents in your soffit—that’s the underside edge of the roof—all the way up to the ridge vents at the roof peak. That air flow helps keep the attic cooler during the summer, and during the winter, it helps keep ice from forming on the edge of the roof. It also guards against mold, mildew, and rot. Rafter vents are usually made of aluminum, sheet metal, or plastic. They come in various lengths and are installed between the rafters, under the insulation. 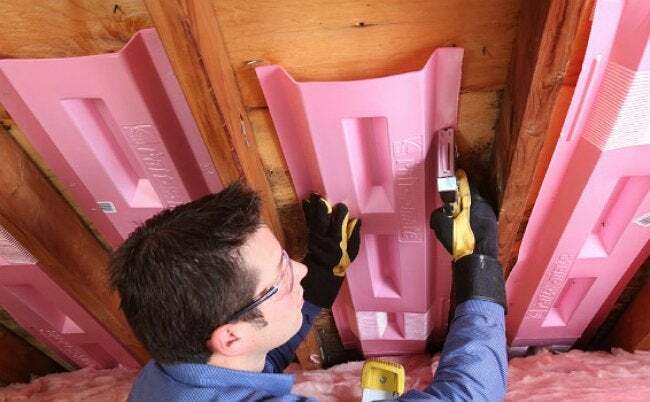 Once installed, they allow you to cover your attic floor with insulation all the way out to where the floor meets the roof. Use a step ladder to install the vents, starting from the edge of the roof and working up to the ridge. And when you’re installing, make sure you don’t cover either end of the vents with insulation. Otherwise all your work will be for naught.